300 Series - to 17"
600 Series - to 22"
800 Series - to 30"
Whatever the subject matter of his paintings, Ray Swanson revealed something of himself as well. His own story, however, explains much about how the man behind the canvas achieved the dream that so many artists share. Ray's childhood and early years reveal how his artistic heritage and rural upbringing molded him into the artist that he became. Ray was able to do for a living what he loved most during his lifetime of 67 years before his untimely death on December 17, 2004. Thank you for visiting the official website of Ray Swanson, premier painter of Arizona's Navajo Indians and cowboys as well as subject matter from around the world. 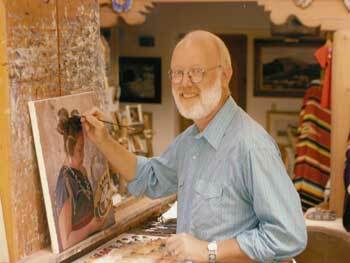 You can read more about his life on the Biography page and see his beautiful artwork reproduced in giclées on canvas on the Collection page of this website dedicated to the memory of Ray Swanson.